A group of Russian sappers have arrived at Khmeimim Air Base in Syria to help demine the ancient city of Palmyra, recently retaken from Islamists for the second time, the Russian Defense Ministry has said. “The latest bomb disposal unit of the International Mine Action Center of the Armed Forces of the Russian Federation has arrived in Syria to assist in the humanitarian demining of the ancient city of Palmyra. The personnel, military equipment and property of the unit were quickly transferred by aircraft of the Military Transport Aviation from the Chkalovsky [Moscow Region] airfield to the Khmeimim air base. After that the detachment made a march [to Palmyra] and proceeded to mine sweep the city,” the ministry said in a statement on Thursday. According to the statement, a total of 150 sappers and 17 units of special equipment have been sent to Palmyra. It also includes a squad of specially-trained mine-detecting dogs. 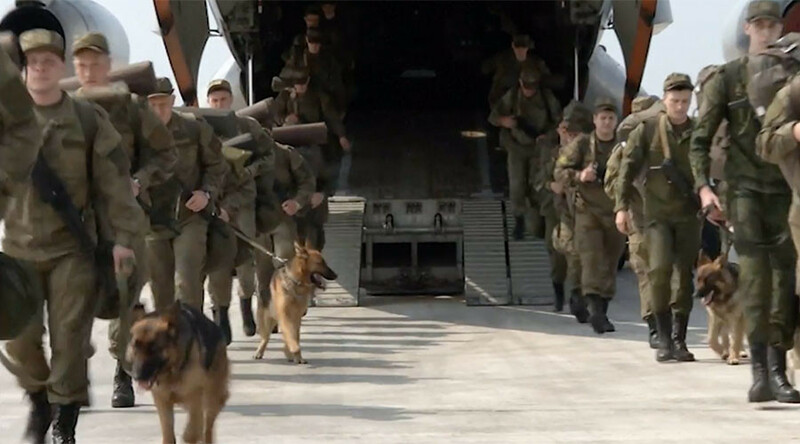 Footage released by the Russian Ministry of Defense on Thursday showed specialists from Russia’s International Mine Action Center boarding a military aircraft at Chkalovsky Airport in Shchyolkovo, Moscow Region, and then arriving at Khmeimim Air Base in Syria. “Our troops are equipped with the most up-to-date means of detecting explosives and mine barriers, as well as protective clothing. We are ready to complete our task in full,” the commander of the demining squad, Valery Avgiyenko, said. The ministry stated that the sappers plan first to clear the city roads leading to social infrastructure facilities, like hospitals, water wells, and electricity facilities, as well as clearing the historic part of ancient Palmyra. Before Islamic State’s (IS, formerly ISIS/ISIL) arrival, Palmyra, which means ‘city of palms,’ was a revered open-air museum just 210km from the Syrian capital, Damascus. The city was first liberated from Islamic State jihadists in March last year. The terrorists, however, managed to recapture it in a surprise offensive in December, while Syrian forces were busy fighting in the battle for the city of Aleppo. The Syrian Army, backed by the Russian Air Force, retook the city from IS terrorists again on March 2, and has been erecting fortifications to prevent yet another counter-offensive. Syrian engineers, trained by Russian sappers, have already begun examining the historic part of Palmyra, looking for mines. 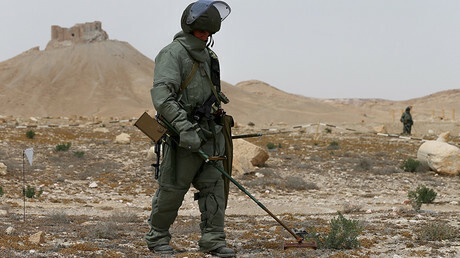 According to the Russian Defense Ministry, in addition to the regular means of de-mining, this time the Russian sappers brought with them innovative models of equipment for detecting explosive substances, as well as new protective attire, which they will be testing in the course of their work in Palmyra. During their previous operation in Palmyra, which began in April last year, Russian engineers destroyed nearly 3,000 explosive devices left behind by Islamic State in Palmyra, clearing 234 hectares of land, 23 kilometers (14 miles) of roads, and 10 architectural structures, according to the head of the Russian Army’s engineering unit, Yury Stavitsky. Apart from Palmyra, Russian sappers have also been successfully working to help clear residential areas of the Syrian city of Aleppo, which the Syrian Army retook from militants at the end of last year.